My first impression of Warsaw was how well built the place was. The city is very much a celebration of the versatility, beauty and strength that can be found in concrete. Yes concrete is an excellent building material, but don’t build a whole city out of it. Perhaps I am being a little harsh, after all Warsaw was almost entirely destroyed by the Germans in 1944 following the Warsaw Uprising and had to be rebuilt from scratch. Warsaw is sometimes known as the “Phoenix City” because it has risen from the flames. 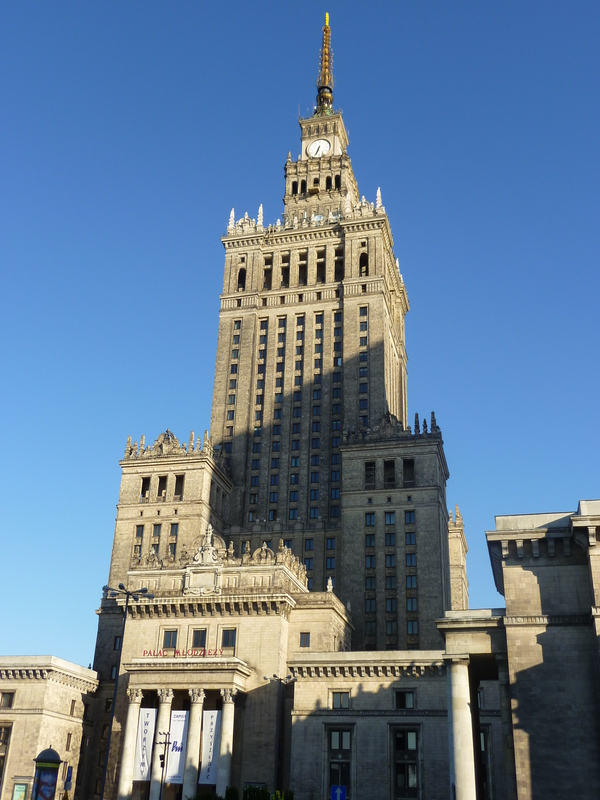 The first thing you see upon leaving Warsaw Centralna is the Palace of Culture and Science. If you include the spire it stands at 231 metres tall. Construction of the building took place between 1952 and 1955 and was a gift from Joseph Stalin to the people of Poland (although Stalin died before the building was completed). Although not a particularly attractive building it looks very unique and imposing against the Warsaw skyline. It was already dinner time by the time we checked in at the hostel, so Chris and I asked the unreasonably attractive receptionist to recommend us a restaurant. She recommended a traditional Polish eatery a short walk from the hostel, though given her good looks she could have recommended McDonalds and I’d probably have gone along with it. The menu at the restaurant was based almost entirely around dumplings. It seems you can have dumplings with just about anything and I eventually settled on salmon and camembert. Chris and I were also pleased to find all the staff in the restaurant were excessively good looking, which did cause something of a distraction for most of the evening and also meant that we had to stay there for as long as possible. Consequently a lot of Tyskie was consumed that evening. After breakfast the next morning we visited the Tomb of the Unknown Soldier which contains the remains of a soldier killed during World War I. The tomb was guarded by two angry looking Polish guards who looked less than impressed with how close I was standing to the tomb. From there the two of us took a stroll through Saxon Garden and on into Stare Miasto (Old Town). 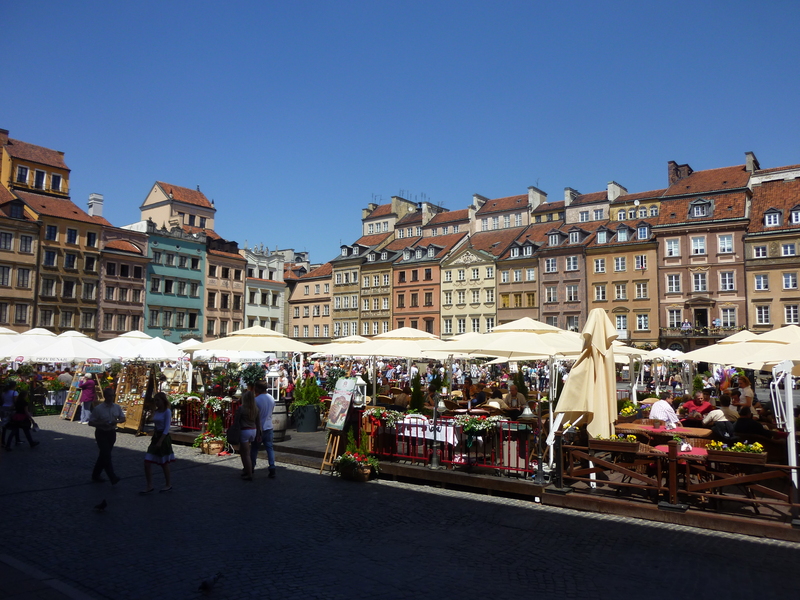 The Old Town is the main tourist destination, possibly because it is the only attractive part of Warsaw. Along with the rest of Warsaw it was completely destroyed during World War II, but has been rebuilt in the original style and using as many original materials as possible. Regardless of my thoughts about the rest of the city, there is no denying the hard work that has gone into beautifully restoring the Old Town. After stopping to eat a slightly distressed looking burger we headed for the Warsaw Rising Monument and the Warsaw Ghetto Monument. Although it is difficult to describe (or imagine) the horrors that took place in Warsaw during the Second World War the two monuments are a fitting tribute to the strength of the people of Poland. Thanks largely to Google Maps we struggled to find the Warsaw Rising Museum, which at one point looked like it might have been located in a shed. Anyway, we found it in the end and spent most of the afternoon their educating ourselves on the events of 1944. To give a brief overview the Warsaw Uprising began on the 1st August and lasted for 63 days. During that time the Home Army (resistance fighters) received little in the way of outside support, yet they were able to take control of large parts of the city. Controversially the Red Army (who were pushing through from the east) did not enter the city until the Home Army had been defeated and what remained of Warsaw razed to the ground. It is estimated that 15,000 Polish troops and between 150,000 and 200,000 Polish civilians were killed in the Uprising. Soviet troops eventually liberated Warsaw on 17th January 1945 from the retreating German Army. Although from a historical viewpoint the museum was extremely interesting Chris and I felt that that the exhibits were laid out in a rather confusing way. Instead of being set out in chronological order the museum presents a mishmash of information which is a bit confusing if you aren’t too familiar with that period of Polish history. In the evening Chris and I struggled to translate the Polish menu at a restaurant and so decided to play it safe and get some steaks and chips accompanied by a few pitchers of beer. We reflected on the days events and planned what we would do at our next destination, Kraków. Following breakfast at the hostel in Dresden Chris and I set out for the station where we would board a train to Prague. Upon arriving at the station we were treated to some light entertainment by a jazz band. A large crowd had gathered around to watch the band, seemingly more interested in the music than they were boarding a train. Perhaps I had the wrong end of the stick and this was simply a fun day out for the Germans. At one point the jazz band were joined on stage by a man dressed as a Hippo. Quite how this related to the music (or anything else for the matter) I am still unsure, but everyone seemed to go along with in regardless. Eventually Chris and I boarded the train to Prague. The train line follows the Elbe valley pretty much all the way to Prague and we were treated to some spectacular scenery. Upon arrival at the hostel we headed straight for the bar where we would do some planning for the next few days. Obviously we had to order a couple of beers as well and were surprised to find that they cost just £1.50 each (although we would later discover that this is actually quite expensive for the Czech Republic). Having drawn up a list of things to do over the next few days we set out in search of somewhere to eat. Our trusty Lonely Planet guide had recommended a pub called Pastiča, and we were not left feeling disappointed. Chris enjoyed a meat skewer and I was treated to a fine fillet of baked salmon. The meal was accompanied by several glasses of Pilsner Urquell (which was even cheaper than the stuff in the hostel), and the two of us eventually returned to HQ feeling full and possibly slightly drunk. The next day we took a walk down Wenceslas Square, which is actually more of a long road than it is a square. 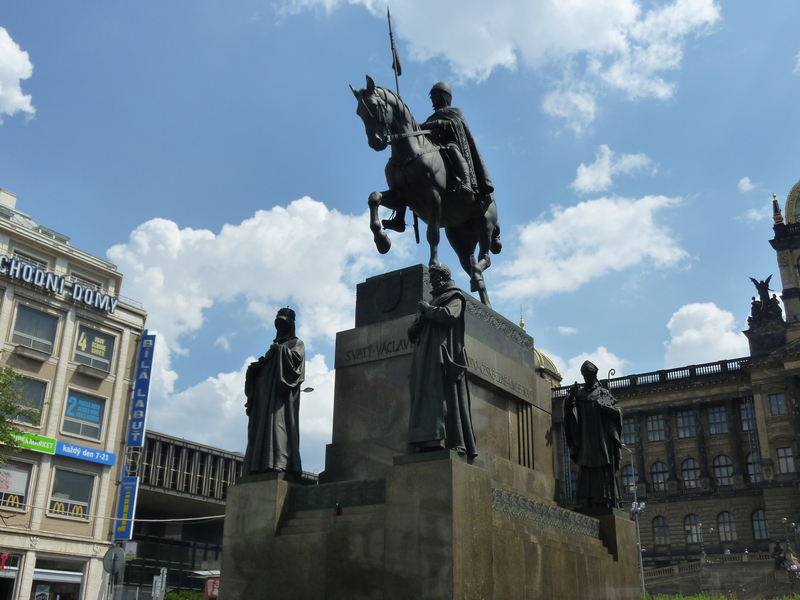 At one end of the square is the National Museum and a monument to Saint Wenceslas, the patron Saint of Bohemia. Over the years the square has played host to many demonstrations. In January 1969 a student by the name of Jan Palach burnt himself to death in protest at the Soviet invasion which had taken place the previous year. The following month another student called Jan Zajíc also set himself on fire. Twenty years after their death the Velvet Revolution took place and the Communist Government was finally overthrown. There is now a memorial in Wenceslas Square to recognise the sacrifice that the two men made. Statue of Saint Wenceslas. By all accounts he could party pretty hard. Having walked through the Old Town we crossed the River Vltava and headed up the hill to Prague Castle. Construction of the castle began in the 9th Century and didn’t really stop until the 1700s. Due to damage sustained in various wars and the subsequent rebuilding that has taken place the castle doesn’t conform to any particular architectural style. The Castle is home to several Churches and Palaces, but perhaps the most impressive are the Saint Vitus Cathedral and Saint George’s Basilica. Prague Castle is a great vantage point and there are some superb views to be had over the city. After making the long descent back to the city the two of us paid a visit to the so called Lennon Wall. 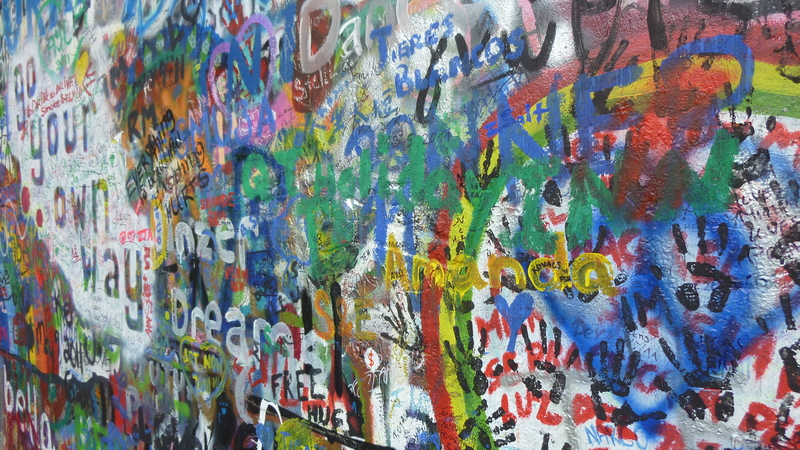 The wall is covered in ever changing graffiti and was originally seen as a way of protesting against the Communist Government. Now it has become something of an ongoing art project and tourist attraction. The Lennon Wall, named after Celtic Manager Neil Lennon. As it was the final day of the Premier League (or as Sky Sports had called it “Survival Sunday”) we headed back to the hostel to watch all the action unfold. With five teams still battling against relegation we were confident of seeing some great action. Unfortunately we were stuck watching the Tottenham vs Birmingham game. Based on the first half performance it looked like Spurs were desperately trying to avoid Europa League qualification whilst Birmingham seemed pretty open to the idea of being relegated. Fortunately things picked up a little in the second half and Spurs eventually won 2-1 much to their annoyance. In the evening we headed out to a little Thai restaurant just around the corner from our hostel. I’d never had Thai food before so I didn’t really know what to expect. I can’t remember the name of the dish, but it was essentially prawns and rice in some kind of red spicy sauce. Once again it turned out to be an excellent choice. The evening meal was finished of nicely with some jasmine tea with honey, which might be the best thing in the world. On our second full day in the city we took a trip to the Communist Museum. We had looked for it the previous day but hadn’t had much luck. This time however we were more persistent in our search and found the museum hiding away between a McDonalds and a Casino. The museum goes into a reasonable amount of depth about Czech 20th Century politics starting with the Nazi invasion, going right through the Cold War and the Soviet invasion of 1968 and ending with the collapse of the Soviet Union and the fall of the Czech Republic’s Communist government. Although the exhibition was very informative there was a strong anti-Communist agenda which was sort of understandable given the the Czech Republic didn’t have the best of times under Soviet control. Afterwards we crossed the Vltava and took a stroll through one of Prague’s parks which was located on the side of a very steep hill. After a hard days work it was necessary that we get some food from somewhere, so in the evening we headed to a traditional Bohemian style restaurant. Here I was treated to a pork sausage starter along with onions, chilis and peppers followed by a main course of beef stew with potatoe pancakes. Once again several glasses of extremely cheap (around 96p) yet very tasty beer were sampled. On our final full day in Prague we paid a visit to Vyšehrad which is another Castle located on top of a big hill (although on the opposite side of the river to Prague Castle). Within the Castle walls is the Basilica of Saint Peter and Saint Paul. 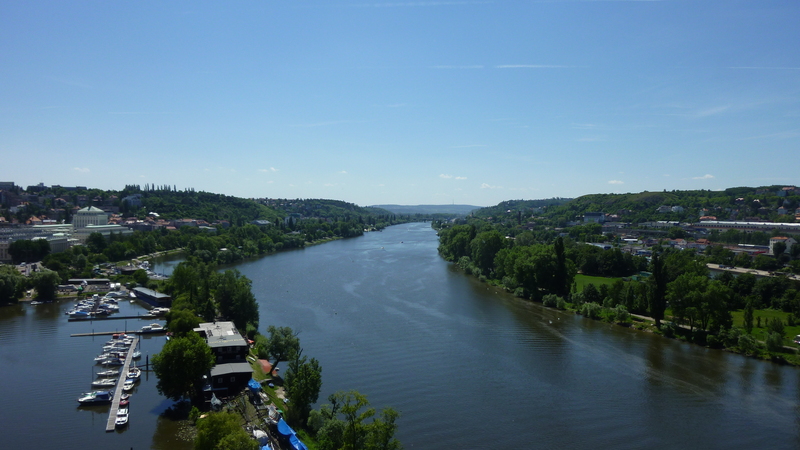 Once again we were treated to some stunning views, although due to the location of Vyšehrad these were more views of the Vltava and the valley it flows through rather than the city itself. View of the River Vltava taken from Vyšehrad. Our original plan that evening had been to take the night train from Prague to Warsaw, but unfortunately (or fortunately depending on how you view the idea of sleeping on a train) we were unable to get reservations so we ended up spending another night in the hostel. This meant moving to a smaller, slightly more expensive yet far superior room for the night. Prague is an extremely beautiful city and I thoroughly enjoyed my stay there. It also had an extremely different feel to any of the other cities I have visited so far. This may have something to do with the language (although most people spoke perfect English) and the fact that it was under Soviet control for so many years. More likely I suspect that the price of beer and the size of the food portions may have greatly added to my enjoyment of the place.